To spread awareness about cleanliness the central government of India has started Swachh Survekshan 2018 for the citizens of the nation. Anyone, living in this country can take part in this initiative to provide a clean city. Under this initiative all the cities of the nation can participate and according to their performances they will be ranked. Ministry of Housing and Urban Affairs has launched this initiative back in July 2017. Swachh Survekshan 2018 is a survey based initiative where the survey will be done by the Housing and Urban Affairs Ministry. Total 4041 cities will be participating in this scheme. They all will be instructed about the survey tool kit, related methods and how to implement the survey and so on. Competition: There will be various competitions regarding cleanliness between these 4041 cities across the nation. Competition will be starting from 4th of January 2019 and will end up on 31st Jan 2019. Need for the initiative: It is a part of Swachh Bharat Abhiyan. To promote this Modi-government led cleanliness scheme, this competition is being initiated. Along with such competitive nature, the survekshan will also provide some education regarding cleanliness of your city. Main Parameters of the survey: There are 6 main parameters upon which the survey will be done. These mentioned parameters will be the areas which will be considered for the ranking of the cities. These parameters are Capacity Building, Collection and Transportation of Municipality Solid Waste, Innovation and Best Practices, IEC Activities, Processing and Disposal of Municipality Solid Waste and Sanitation Field progress. The main objective of the scheme is to provide cleanliness to all the cities in the country. As mentioned the initiative has been taken to promote the largest cleanliness scheme Swachh Bharat Abhiyan. People of the nation must know about the hygiene and proper sanitation at home and work place. Each family must have at least one toilet at home. Besides people from town or suburb area should not defecate in the open area. Along with competition the scheme will also provide basic knowledge and education that will motivate and make people understand the importance of cleanliness around us. All the petrol pumps in the country or such open places should have two separate toilets, one for men and the other for women. Proper water supply and such should be in those toilets. As said that there will be competition between the cities of the nation, there will be point’s distribution as well. Cities will be given points on the basis of three sections, general observation by the authority, feedback from the citizens and Efforts by the local municipality. The distribution of the points is 30% (general observation), 35% (feedback) and 35% (efforts by municipality). On the basis of above mentioned 6 parameters these three sections will be counted and the points will be given to each city. Depending on these points cities will be ranked. Swacch Survekshan is said to be the largest cleanliness initiative in the world. The central government has requested all the inhabitants from these 4041 cities to join the move and make it much bigger. Swachh Bharat Abhiyan is now at its second phase where the scheme has been shifted to sustainability from the process. Within couple of years (till 2nd October 2019) the central government will make it the biggest movement ever. The official website for the initiative is https://www.swachhsurvekshan2018.org/. After SBM, central government took another initiative to ensure better cleanliness in rural areas. 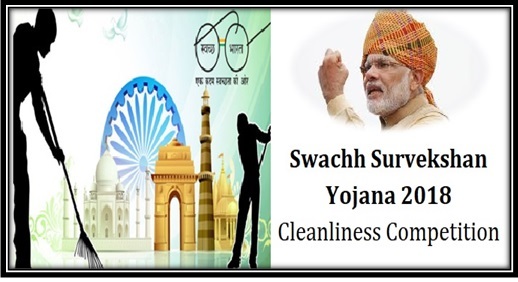 The name of this scheme is Swachh Survekshan Grameen Scheme or SSG. In the first phase, it has been implemented in Uttar Pradesh, Maharashtra and Jharkhand. If the scheme offers satisfactory results in these areas, it will be implemented in other areas as well. It enhances sanitation and cleanliness in rural areas. During this year’s 2nd October celebrations, such districts and states will receive special rewards from central Drinking Water and Sanitation Ministry. It is the responsibility of state authorities to popularize the scheme amount people in rural areas.